September brings us the underrated Ironweed. I always look forward to their purple splender. This tall wildflower is a butterfly magnet. The New York Ironweed (Vernonia noveboracensis) is common, statewide in moist bottomland fields. Tall Ironweed (Vernonia altissima) is common in moist areas west of the Alleghenies. One other ironweed can be found east of the mountains. The Broad-leaved Ironweed (Vernonia glauca); though rare, may be found in some locations to the East. The purple flowers of these species are a host of numerous butterfly, moth,wasps, bees, flies, bugs and other insects. A pure field of Ironweed in the perfect light is a sight to see. Yellow Ironweed (Verbesina alternifolia) is the common yellow flower of roadsides and fields. This tall yellow flower; while is by no means spectacular or rare, is an important host for many species. While on your travels through the fields and forests of September, do not forget to observe the weeds. You never know what you will find there. One sure way to get the greatest pleasure from the outdoors is to diversify your interests. We tend to get stuck in the rut of doing the same thing at the same place, all of the time. I once read that the average American spends 90% of their life within a 30 mile circle of where they are born. I would be willing to bet that the circle is smaller in West Virginia. I am not going to suggest travel in order to spend time outdoors, not in these days of high fuel prices. You can get more enjoyment from the places in which you normally spend time. You probably already know where the turkeys roost and the deer feed in your normal haunts. When can you expect to hear wood frogs at their breeding pools, on what date do the scarlet tanagers return? You cannot answer that one can you? The old-timers knew when to expect everything. The TV generation does not. Here is my one little challenge to you. During the next month, learn to identify one bird, butterfly and tree that you are not familiar with and do this within one mile of your home. I can hear you thinking now. You know everything that grows and flies in your area. No, you don’t and you will be happily surprised to learn this when you give it a chance. Be observant and my prediction is that you will not stop at one new species. Those who spend time on the water can add diversity to their pastime, by paying a little more attention to aquatic life; other than fish. Learn about the underwater organisms and how they fall in the food chain. Remember, the key to catching fish is to know when, where and what the fish is feeding on. This is all based on water temperature and life cycles of smaller organisms. If you want a real eye-opener, get involved with a watershed improvement organization. Volunteer a few hours to participate in water quality monitoring and make sure you do a benthic survey. It will not be difficult to find a group near your home and all are in need of help. You will enjoy the work and will learn to appreciate our waterways in a different way. Photography is the one thing which has made my outdoor life more meaningful. Skills of stealth and the power of observation are two necessary requirements of nature photography. Curiosity is also important; you do not want the title of your photo to be cute caterpillar. You will scour field guides to find out what the image really depicts. This research will likely bring back things that you used to know; before your mind became cluttered with important things like algebra. Photography can be simple or advanced. It is up to you in how well you choose to advance your skills. My one tip on this subject to help shorten the learning curve is to: learn how to set your white balance manually. If you are one who quit learning when you graduated; shame on you. Learning is a lifelong experience. Diversify and improve your quality of life. 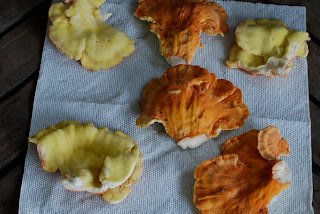 The Chicken of the Woods (Laetiporus sulphureus var.) 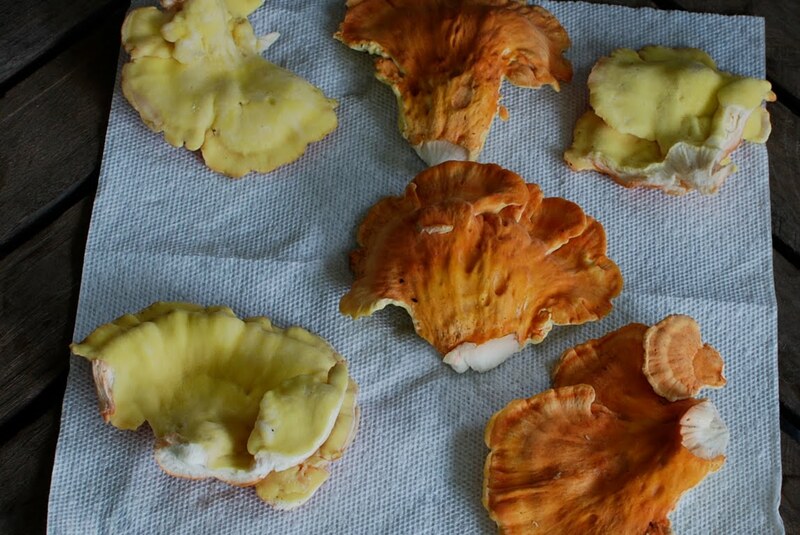 is without a doubt; my favorite edible mushroom. It is a shelf mushroom, which grows on decaying wood. The color really stands out, especially on a rainy day. I saw these on a stump yesterday; from about a hundred yards away. I was only fortunate enough to find one clump last year and wasn't able to enjoy the delectable flavor. I had the Hog Flu and couldn't taste anything. These, which I found yesterday are just about enough to make you want some more. The October sun melts a touch of frost. Water drips from the asters and goldenrods. Geese honk overhead, heading to a distant cornfield. A squirrel runs amongst the limbs of a tall hickory, searching for a meal. There is a crispness in the morning air. The hillsides are covered with hues of red, orange and gold. That smell is in the air. The smell of autumn. I can remember the smell from decades past. The aroma of a new box of shotgun shells, Hoppes No. 9 and 3 in 1 oil. The shells had to be Peter’s True Blues, 2 ¾ inch number 5 shot, they probably just smelled better. I would carefully load them into my hunting jacket, always more than were actually needed. A black plastic trash bag was always placed into the game pouch. Yes, we actually sat on the ground. Even when it was wet. Carry along chairs and seat cushions hadn’t been invented. Saturday has arrived, I am sitting under a huge beech tree in the morning darkness. Nodding off, fighting the effects of a restless, nearly sleepless night I await the mornings light. The shooting starts in the east as sunrise approaches. I can hear a rustling in the leaves behind me. Shortly thereafter, my first bushy tail on the season is placed in my game pouch. Squirrel season has officially opened. Shotgun fire was heard in the hills around town during the entire month of October. The hills are silent now. The hickory and beech patches we were drawn to in youth are long gone. They have been replaced by impenetrable blackberry thickets. The memories of days spent stalking squirrels will always remain. October has many things to offer the outdoors person. It is the perfect time for mountain biking, camping and hiking. Hunting seasons are opening and fish are gearing up for a final feeding frenzy, prior to cold water conditions. I caught my two largest smallmouths of 2007 on October 30th. The WVDNR will be stocking selected streams and ponds with trout between Oct. 12 and the 22nd. They usually put in a good number of larger brood trout at this time. They make perfect fillets for the grill. Bass and musky are on the feed at this time. The normally low water conditions make finding fish concentrations a little easier. Squirrel season opens on October 9. Archery season for bear and deer comes in on the 16th, along with ruffed grouse and raccoon hunting season. Trappers should be finished with preseason preparations and awaiting opening day. The traditional fall turkey hunting counties will be open from Oct. 23 through Nov. 20. Other counties have different season lengths, be sure to check the current WVDNR Regulations Summary or go to http://www.wvdnr.gov/. Most importantly, a squirrel season will be held for youths no older than fourteen, on October 2nd. Take someone out and start creating new lifetime memories. Get outside and enjoy the early fall days. Don’t get stuck in the I’M A GONNA rut. I’M A GONNAS never happen. Autumn is truly a season of anticipation. The thick sticky nights of summer have arrived. It is the perfect time for a quality-time evening fishing trip. Nothing is on TV and the muggy air makes it too hot to sleep. Gather up some family or friends and take advantage of one of our most under-utilized game fish. There is a fishable population of channel catfish near you, no matter where you reside. They do not require specialized equipment or hard to find bait. The smaller fish that you catch make fine table-fare. Channel catfish live in a wide variety of habitats, ranging from clear, swiftly flowing streams to sluggish rivers, reservoirs and ponds. Natural reproduction occurs in rivers and larger reservoirs. Smaller ponds usually need to be stocked on a regular basis to maintain fishable populations. The West Virginia Division of Natural Resources stocks many West Virginia impoundments with catchable size channel cats during the month of May. Some of the bodies of water receiving stockings in 2009 were Cedar Creek State Park Lake, Conway Run Lake, French Creek Pond, North Bend State Park Lake and Watoga State Park Lake. These fish will provide fishing throughout the summer. Channel catfish are omnivores and feed on a wide variety of food items. Young fish feed on aquatic insects and zooplankton. Larger fish feed on insects, crayfish and minnows. Big fish over sixteen inches are predatory and eat fish. The preferred feeding water temperature ranges between 75 and 85 degrees. A wide variety of baits can be utilized during an evening of cat fishing. Night crawlers, chicken livers, hot dogs, live minnows and cut-baits are all used successfully. Commercially made stink-baits are extremely popular. They are usually concoctions of smelly cheese and chicken blood, used with some type of specialized bait holder made of sponge or hollow tubes. These baits are the most popular when in pursuit of eating sized fish, under sixteen inches. Remember, big fish eat meat. The WV state record channel catfish was 40.3 inches long and weighed 33.42 pounds. It was caught in Patterson Creek, in 2005. You do not need fancy gear to enjoy an evening of fishing. It is the basic hook, line and sinker deal. I do prefer to use circle hooks when bait fishing. This hook type sets in the corner of a fish’s mouth, making it easier to release larger fish to reproduce and keep your fishery alive. You do not need to set the hook with circle hooks. The hook is set by the fish exerting pressure on a tight line. One high-tech device you will need is the classic forked stick rod holder. A light source, cooler, folding chair, stringer and bug spray will pretty much take care of your equipment needs. The channel catfish is a member of the Ictaluridae family, which includes at least 45 species. If you don’t have channel cats near you, you probably have flatheads, blue catfish or bullheads. The lazy days and nights of summer are made for cat fishing under the shade trees or by the lantern’s light. It is quite enjoyable sitting there with nothing to do except watch for the twitch of the rod tip. What has become of simplicity? Low gray clouds loom on the horizon. A cold front has moved through the region, dragging a steady drizzle behind. The air temperature is in the mid-fifties, fog is settling in. The streamside parking areas are void of vehicles. A few days ago, there wasn’t room to park. I pull into a wide spot below a normally crowded bridge, not one angler is in sight. I watch the river, while tying on my leader. A pair of green drakes emerges and head upstream, their destination seems to be an overhanging birch. They are consumed by a tree swallow, before reaching the tree. I tie on a pair of Picket Pins. I do not see any feeding activity near the bridge hole. I move downstream where a swift riffle has gouged out a deep area undercutting a system of tree roots. The first cast results in a missed strike from the root system. I roll-cast to the same spot and hook a fourteen inch rainbow, the fish is released. A mink works its way upstream and enters the root system. I notice a dead rainbow about eighteen inches long, at the tail of the pool. Hopefully, the mink can make some use of the deceased trout. I fish downstream, wet flies swinging in the current and not much is happening. The creek chubs aren’t even interested. Various flies are hatching, a few sulphurs, blue-winged olives and green drakes, but not enough of anything to bring trout to the surface. I find four browns at a fallen hemlock. They aren’t interested in anything that I show them. They just sulk on the bottom. Darkness is quickly approaching. I see a rise downstream, at the next river bend. I move down and observe. The trout are feeding heavily, slashing the surface. Cream colored caddis flies are hovering just above the water’s surface. They have started a feeding frenzy with the previously lethargic trout becoming willing participants. I dig through my box and find an elk hair caddis. I struggle to get the tippet through the hook eye, in the failing light. Each cast results in a hook-up or a slashing miss. I can no longer tell were the fly is and strike at every nearby rise. The action is fast and furious, in fifteen minutes; I caught and released 7 small browns and rainbows. Then it happened. The fly drifted toward the pools tail, a noisy splash, the line is tight and the weight of the fish is noticeable. The line goes limp, fish and fly are gone. I begin the upstream walk to my truck, through the fog and drizzle. The season has officially begun. The trout fishing season in West Virginia is year-round, but for me and others the season begins when the trout stocking ends. The crowds disappear, parking lots are empty and the fishing on most streams is excellent. There are plenty of trout available and as long as the water level stays fishable there is good fly fishing on most streams well into July. Head for any of the trout streams in the mountains of West Virginia and enjoy the mountain laurel bloom, along with some excellent fly hatches. You will not be disappointed. Always remember that the fishing begins when the stocking ends. The precious moments that we have to spend in our outdoor pursuits could be more productive, if we would devote a little more time to thinking about what we are trying to accomplish. Son House, the legendary singer of the Delta blues, said in an interview,” the world would be a better place if we would all think twice; before speaking once.” This statement could be applied to many other aspects of life. Take a little time and think about what you are doing, instead of using the exact same methods time after time. The popular bridge hole is always a high priority fishing destination. Try this: find the nearest aquarium, scrape your fingernail very gently down the glass, watch the fish move to the other side. Now, think about what is happening underwater, each time a vehicle passes overhead. Those bridge fish spend all of their time spooking or preparing to spook. A more productive use of your time would be fishing downstream or upstream of the bridge; where every passer-by stops for a few casts. We all know how our vision is enhanced, when hunting from an elevated deer stand. Think about it the next time you drive down the road and park for your next deer hunt. Imagine the deer bedded down ¾ of the way up the brushy hillside. They are bedded there for a reason. The experienced ones have already scooted off the backside of the hill, before you ever got your truck door shut. You sit on the fields’ edge until dark and see only a button buck and his sister. There is a lot of deer sign in and around the field, so you return to the area several times during the season. You always approach the area the same way and have the same results on every trip. I wonder why? One thing that I am positive of is that old gobbler that you’ve been “scouting” for six weeks before the season opener, had you figured out long before you thought you had old long beard figured out. It continues to amaze me that turkey hunters do not believe that headlights, four-wheelers and slamming doors do not spook anything. My main rule of successful turkey hunting is to never drive anywhere that you can walk. You will hear and see more walking the gas well and log roads, than you will riding around, drinking coffee and listening to the radio. Never call to turkeys in the pre-season, doing so just diminishes your or someone else’s chances of harvesting that particular bird, when season opens. We are now nearing the time of the wonderful Allium tricoccum. I really do not like to gather ramps in places where they are not extremely abundant. I prefer to walk away from the road for twenty minutes and stop at a couple of places and dig all that I need. I find this a lot more enjoyable than trying to find enough for my needs, within sight of the road. They are getting pretty scarce in easy to reach locations. All that we need to do, to be more successful and enjoy life a little more, is Think. This Article Appeared First In Two-Lane Livin. The date is July 10, 1861.Smoke drifts across the Roaring Creek Flats of western Virginia, it hangs like fog in the valley below. On June 16, Confederate troops; numbering 1300, began building fortifications on the western slope of Rich Mountain which would become Camp Garnett. The troops surely utilized the abundant resources offered by Roaring Creek and its tributaries during their encampment. On this night, a comet passes overhead and is taken; by the soldiers, as an ominous sign. They were right: More than eighty will die - tomorrow. One hundred and forty-eight years later, we can only speculate about the quality of the fishery present in the Roaring Creek Watershed at that time. We know two things: the fishery does not have the quality of 1861, and it can be improved upon now. Roaring Creek has fought its own battles over the years, it is a survivor. There is hope for recovery. Numerous tributaries of Roaring Creek have populations of brook trout which are isolated, due to water quality issues. Two streams are severely impacted by acid-mine drainage, effectively eliminating downstream life. On July 25, 2009; representatives from the National Mine Land Reclamation Center, DEP and members of the Mountaineer Chapter of Trout Unlimited converged upon the Roaring Creek Watershed. The goal for the day was collecting low water flow data to compare with data collected from the April 18th monitoring workday. Selected sites were electro-fished to determine if fish were actually present in the watershed. Data collected includes: pH, dissolved oxygen content, conductivity, temperature and presence of metals. A flow-meter is used to determine the volume of water flowing at each site. The information from this data will be used to design a passive treatment system to improve the quality of the watershed. Seven sites were electro-fished; brook trout were collected at 4 locations. One site proved to be too deep and wide for effective sampling, one unidentified, fleeing fish was seen at this location. Fish collected at 3 sites included a healthy mixture of black-nosed dace, mottled sculpin and brook trout. One location had brook trout only in its lower section and was possibly impacted by in-stream obstructions. The other two streams are known to have trout populations in the 1970s and are possible candidates for limestone sand treatment in their headwaters. Late-afternoon storm clouds rolled in from the south as the four groups finished the day’s fish and data collection. The only attacks came from angry yellow jackets and “sewer bombs” in downtown Coalton. The day was a huge success; we have documented proof that the watershed of Roaring Creek is not dead. With the help of dedicated individuals, the watershed can recover and become productive once again. We all like the various images of beautiful butterflies. But, while enjoying the visual aspects of a quality photo, do you ever wonder about the skills and luck involved? It is not as easy to get a good shot; as you may think. For one thing, butterflies do not hold still. they are constantly on the move. Wings are flapping to hold balance and they are usually slowly creeping forward; while feeding. 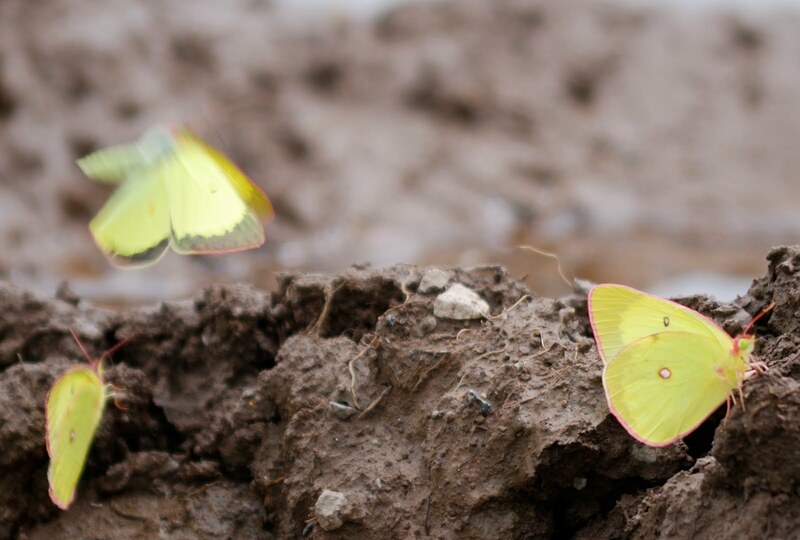 Try to get a good image of a cluster of puddling butterflies and you will soon she what I mean. They are never syncronized with their movements. Many of my photo opportunities are in Canaan Valley. Have you ever been there when the wind wasn't blowing? As you can see from this shot of Pink-edged Sulphurs; it just isn't easy. Not in the real world.